I'm pretty excited to share my first series titled "Winter Ghosts." I've been focusing mainly on creating individual images. However, I've come to find that I really enjoy the context that a series can add to an image, as well as giving the opportunity to expand on an idea that is hard to capture in just one photograph. This series of double-exposures was made using a lamp and paper cutouts to place light-bodies against cloudy winter landscapes. I made this work during what has been a somewhat dark period in my life. Meanwhile, I’ve been doing a lot of work on myself. The idea for the light-bodies that seem to be ascending were born out of my desire to transcend my place in life, as well as the light that one can become aware of during their winter. This series is very personal to me. I’ve been putting a lot of work into developing different processes of image making. Winter Ghosts feels like the culmination of a lot of the work I have been putting into process, combined with my inner work. This winter has been extremely challenging for me. I’ve often wanted to escape my place in life, but it’s in this place that I’ve been able see that acceptance is the only way to truly transcend. In the sea travel days of olde, I imagine great ships caught in a windless mile without power for their sails: caught in the doldrums. There are days, weeks, and even months where the creative inspiration never strikes. This is where I feel blessed to be a photographer and not a painter. All I have to go is force myself out the door with a camera, and the external world will coax me to push the shutter button. Sometimes this is not the easiest thing to do, but as a sea captain of olde, I get out the oars. There are multiple ways of approaching making images, and luckily for us some ways require very little forethought. Sometimes the idea comes first and I set out on a mission to create what is in my mind. Most of the time I set out to a location that I am fond of in the correct lighting and see what there is to photograph. Sometimes the two are not so clear cut. For example, I know that I want to take double exposures using hands in the woods. But I have no mental image of how that will pan out. So it is partially planned. The opportunity to just set out and see what the external world provides is a blessing to us photographers. Currently, my doldrums are being caused by lack of appropriate gear. Once you have shot with a certain setup that works well for you, and that setup fails, it is difficult to regress to your previous equipment that you deem inferior for whatever reason. Meaningful images can be made with any camera, so sometimes I view obstacles of this nature as a challenge. In theory gear should never be a limiting factor, but in practice somehow it often seems to be. A shift in perspective, and viewing it as a challenge can help to spark creativity. Along the same vein, a new bit of gear can inspire a whole project. And it doesn’t have to be expensive. A nylon stocking for example can be used as a softening filter and could generate new ideas. I often use whatever is around me to manipulate images. It’s fun and the images that are made are certainly unique. While the doldrums are certainly a pain, you have to decide not to die at sea. You have to decide that you are going to make it to the place where your sails will be filled, and you will get there. But don’t kill yourself rowing either. Sometimes waiting out the calm, and doing something else creative or relaxing for just long enough for the wind to come back is the best thing one can do. Photography is an act of resistance, in that it brings things into the light. The powers that be often deal in secrecy. Control is difficult to maintain when everything is out in the open. What is kept in the dark controls us. I’ve noticed that this is true for me on a personal level. I’ve even noticed that bringing awareness to my bad habits is enough to initiate change in my personal life. In dealing with troubling emotions or healing trauma, often acknowledging, becoming aware of, and accepting a feeling is enough to release it, or begin to transmute it. In these modern times, cameras have become weapons of truth: ways to hold those in power accountable, ways to share information with the collective--bringing the darkness into the light. As we become aware of injustice, we move to correct it. I believe there are more empathetic humans than not. When presented with true information, as a collective we move toward healing. The controllers and manipulators that cast darkness are few compared to the empathetic, making the camera (especially in conjunction with the internet) a very powerful tool. So bring to light everything. Bring light to the light, this only encourages. When we air out our dirty laundry, we move to correct it. Shine a light on the darker corners of our world. When exposed, the darkness loses much power. In fact, you may end up laughing about how much hold a small corner of darkness once had in your life. When I photograph, I pay attention to my intuition to see what I am drawn towards and when to push the shutter release. With this in mind, each outcome of my practice is imbued with personal meaning. Following this intuition connects me to the forces larger than me as well, and allows me to commune with them. What is brought to light is a product of my communion with the divine. In a sense, I am a conduit for it to move through me and my practice becomes much larger than me as an individual. Anyone can have this relationship through awareness. This perspective allows a new weight to be placed on what is brought to light. To me, photography is communion with the divine. The image capture is a communion with the external world, and the sharing of the image is communion with the external world as well. Whatever is brought to awareness, whether it is sharing a beautiful sentiment, exposing a dark truth, or just appreciating something seemingly mundane, it is an act of resistance. This consciousness breaks down antiquated power systems within and without. The process of creating a photograph can be just about as complex or simple as a photographer chooses it to be. In its simplest form, with the push of a button on a digital camera one can produce a photograph. For many photographers there are layers of production, or steps to get to a final product. Why then, do some photographers add more steps? The steps themselves can be an important aid to creativity. For example, in order to create a grainy film photograph in black and white with intentional light leaks, there are many steps that are needed to affect the outcome. It is in these steps that the product is actualized. While this is obvious, each step can be taken as a unique opportunity to insert ones vision into the final product. The most often acknowledged step of the process is what goes into capturing the image--what lens, camera settings, etc. However, the image is influenced by the way it is developed, scanned, any post production that takes place. While all of this is very obvious, the interesting part comes when examining a photographer's work, with the understanding that each step that went into producing the work was either a conscious or unconscious decision. So, in producing an image, awareness is key to control. Constraints can be extremely conducive to creativity. Becoming aware of areas of your process that you do not want to change might be important. Awareness can even mean creating parts of your process that introduce variables that are out of your control. My work is largely created around the things that work for me, and produce results that are effective at communicating my vision. While this often includes introducing unpredictable variables, awareness is key to understanding my process and what works best for me. The practice of awareness of process, in turn makes me more aware of my subconscious as I review the results. Photography is a great way for me to interact with the universe with a certain level of awareness. Bringing intent to each part of the process also allows me to most effectively communicate my vision. A camera can lie. It matters very much what the photographer chooses to include and exclude from the frame. One can also adjust the exposure to fake a scene of night or day. One can isolate the subject with depth of field. One can portray motion by slowing the shutter speed. While there are standards of journalism, there is always wiggle room for the photographer to paint the scene. Therefore, a simple wall with an interesting texture and color can be portrayed with conviction by a photographer who understands how to operate a camera. 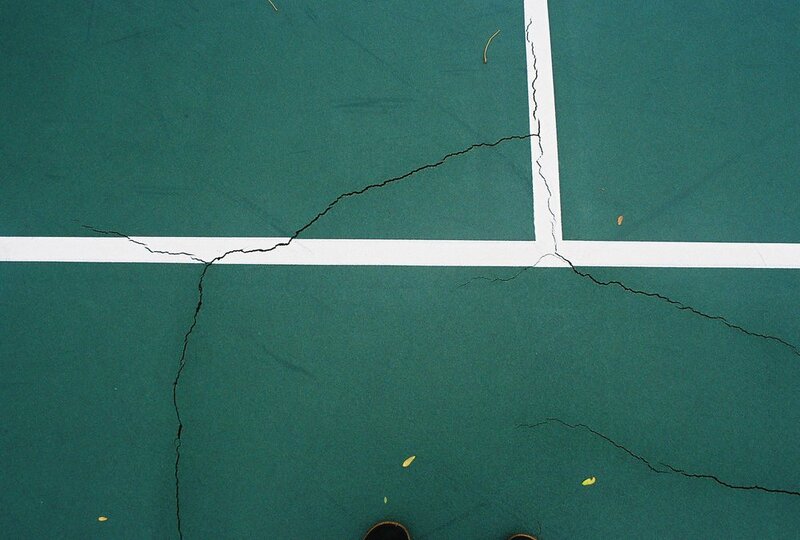 A crack in the sidewalk can convey the feeling of being fragmented. Even using a camera with automatic settings (while this does give up some creative control) can lead to conveying an emotional idea effectively. The photographer still exercises control over the composition, and chooses a scene out of an endless realm of possibilities. Since we are all photographers these days, carrying camera phones in our pockets, these meditations make for interesting fodder for the imagination. Every selfie was chosen to be portrayed in a certain light at a certain time with certain attire, and it means something if you choose to let it. What are we saying with our photos, and is it intentional? Is the intent to document, to convey emotion, or both? I usually don’t feel inclined to discuss my individual images much. I don’t caption my images much on social media, or even title them very often. However, that doesn’t mean that I don’t have a lot to say about my practice or photography in general. Seattle based photographer. Uses film and digital. Shoots with an emotional eye.